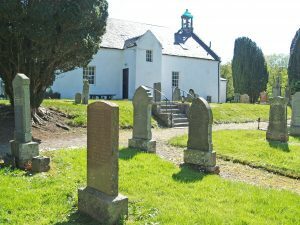 The Kirk – Clachan in Kintyre, Argyll, Scotland. Monday the 24th. December at 7.00pm. Christmas refreshments will be served following the service. All are welcome, so please come and join us. If you walk around the churchyard you will find that, as well as headstones from the last two or three centuries, there are also medieval grave slabs. There are even several stones which appear to date from early Christian tmes, before 1000AD, so this has been a religious site for a long period. Below the archway to the vestry is said to be the grave of a soldier who returned from Culloden in 1746. When alterations to the church took place, members of his family insisted that his grave be undisturbed, and so it remains. Legend has it that he lies there with a loaded pistol and a drawn sword: “Do not disturb” should be taken seriously. The ancient parish of Kilcalmonell stretched right across north Kintyre but in 1753 the eastern part, together with eastern Killean, became the parish of Sadell and Skipness. In the 1960s we were linked with Skipness, but that link was severed in 2003, and we are now linked with Killean and Kilchenzie and Gigha. PS. and IMcD.